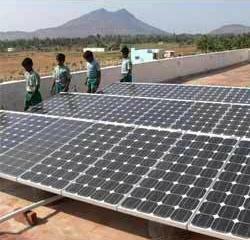 Rajasthan Government to introduce "Roof-top solar power generation" Scheme in Jodhpur as per Rajasthan Budget 2013-14 announcement from Rajasthan CM Ashok Gehlot. Rajasthan is not first state to implement "Roof top solar power generation" project as Kerala and Gujarat already announced this scheme and way ahead in implementation of Roof top solar power generation scheme in state. Rajasthan Govt. allotted Rs. 100 Crore to implement this scheme in Jodhpur city where abundance solar energy is available for more than 9 Months in a year. * Availability of solar energy for whole year in western Rajasthan. 2. Total Fund allocated for Roof-top Solar Power Generation in Rajasthan = 100 Crore.